Until recently I only knew of Vashti Bunyan's debut album Just Another Diamond Day from 1970. Probably because it was produced by Joe Boyd and included guest appearances by members of Fairport Convention and The Incredible String Band. I don't think it was until late last year that I found out she had returned to the music scene in the present millennium, after an even longer hiatus than Judy Dyble. Vashti was discovered by Andrew Loog Oldham in the mid 1960s when he was the manager of Rolling Stones. He tried to do the same with her as he'd done with Marianne Faithfull a little earlier. They recorded the Jagger/Richards-penned "Some Things Just Stick In Your Mind". Released as a single backed with Vashti's own "I Want to Be Alone" in June 1965, to little success. She recorded a second single "Train Song" the following year. According to her during the concert it was only played once on the radio. 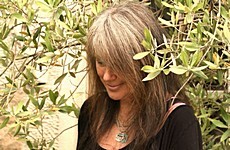 After more recordings for Oldham's newly established Immediate Records that wasn't released and a brief appearance in the documentary film Tonite Let's All Make Love In London (most notable for including a very early recording by Pink Floyd) where she performed her own song "Winter Is Blue", she decided to travel to the Outer Hebrides with her boyfriend to a commune singer-songwriter Donovan planned to establish. They went by horse and cart and the trip took one and a half years. Along the way she wrote the songs that can be found on Just Another Diamond Day. The album sold poorly and Vashti decided to leave the music business all together. She didn't return until a new generation of folk musicians including Joanna Newsom and Devendra Banhart took interest in her music around the turn of the century. The album was relaunched on CD in 2000 with four bonus tracks recorded in the 1960s. Vashti admitted during the concert that she hadn't written any new songs until her children had moved out around this time. She's mainly a slow writer and hadn't enough songs for an album until 2005. Lookaftering (Fat Cat Records) was produced by the renowned composer and musician Max Richer who played several instruments on the album and with guest appearances by Newsom, Banhart, Esper's Otto Hauser, Robert Kirby (friend and arranger of Nick Drake, member of The Strawbs for a while and also string and recorder arranger of Vashti's debut album) and others. "Wayward" was one of the songs she played at the concert from this album explaining the dilemma of staying quite happily at home with the children while at the same time longing to go on the road with 'a suitcase full of notes'. Her third ordinary album Heartleap (also Fat Cat Records) was released last autumn. In the meantime Fat Cat in collaboration with Spinney Records had released a compilation called Some Things Just Stick In Your Mind - Singles and Demos 1964 to 1967 that in addition to her first two singles included numerous other early recordings. Norwegian artist Moddi translated "Train Song" to his native language and recorded "Togsang" for the compilation Hjertestups in 2010. Moddi was also on the bill when Vashti visited Drammen. I arrived just after Vashti had started, too late for Moddi's appearance, but "Togsang" had obviously been included in his set. 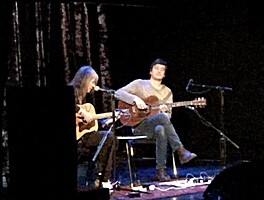 Vashti crossed the North Sea for this sole Norwegian appearance along with her steady companion, guitarist and second vocalist Gareth Dickson. They were only armed with one acoustic guitar each, but it sounded fantastic. I guess they hardly played a chord during the set, only exquisite finger picking. Especially Gareth used several effect boxes; sometimes his guitar sounded like something close to an electric piano. The two albums by Vashti released after her come-back are very hushed down, with few exceptions. Vashti's voice is close to whisper and it may turn a bit weary listening intensively to the albums for too long at a time. In advance I was afraid the concert might work the same way. I needn't have worried. Vashti's voice sounded a bit stronger and she took pauses to explain or tell anecdotes about the songs. She seemed a bit reserved, if not shy, but in a very likeable way. It all added to the cosy intimate feel of the event. We got a couple of more songs from Lookaftering than the one mentioned above ("Lately" and "Against The Sky") and even more from Heartleap including the title track, "Gunpowder" and "Here". We also got a few old doughnuts, at least "Wishwanderer" and "I'd Like To Walk Around In Your Mind", both present on the 1960s compilation album. And of course "Train Song" with some interesting chord, ... eh sorry, note progression. Not quite what you'd expect from a pop single of the mid 1960s. Maybe the reason why it never made it to the hit lists. But it sure is catchy! After the first rendition of the "Train Song" Gareth was offered a solo spot for his own "Two Trains". Not bad at all. He thanked Vashti that had invited him to play with her nine years ago and saved him from a dreadful day job. When I arrived the premises I think I heard the very last notes from a song off Just Another Diamond Day, too. It might have been the title track. The audience was very receptive to Vashti and Gareth and of course we were in for encores. And of course that included yet another version of "Train Song", guested by Moddi. With two verses sung in English by Vashti, one by Moddi in Norwegian and a wordless one at the end by all three of them. Vashti has already or will soon turn 70 years old. She has threatened that Heartleap will be her last album because she is such a slow songwriter. If that's so, I sincerely hope she doesn't finish her career as a performing artist. It was indeed a memorable evening in Drammen!